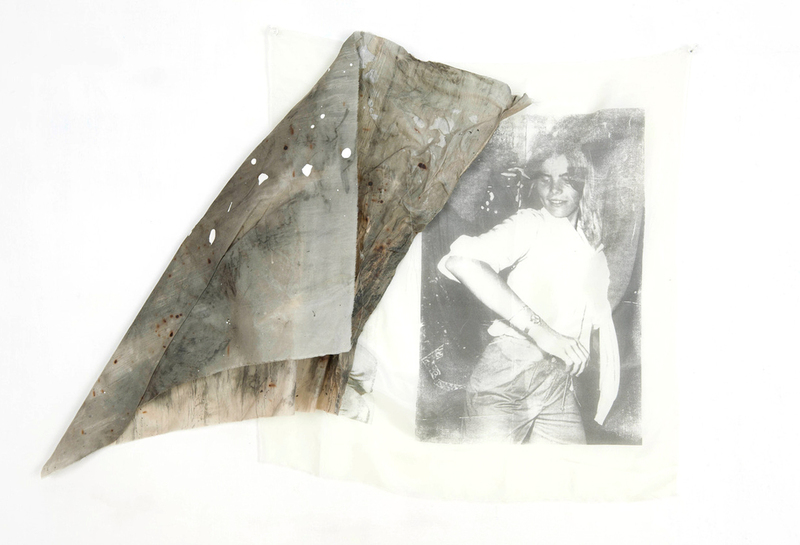 Servane Mary, Untitled (Mariel Hemingway dancing, burned piece), 2011, solvent transfer and mixed media on silk, 22 x 31". Untitled (Mariel Hemingway dancing, burned piece), 2011, is the most visceral of Servane Mary’s sculpturally altered, found photographs of women: A folded scrap of silk, wrinkled and stained with the brindled abstractions of a solvent transfer, hangs like a papery flap of singed skin over a gauzy monotone print of the actress in her youth. By juxtaposing the photograph, a static signifier, and the material appendage, a weathered bodily object, this work functions as a pointed surrogate for the desirable youthful female while making tangible the corporeal decay that will eventually swallow her insouciant beauty. Hemingway’s own familial entanglement with fame, mental illness, and tragedy further heightens this tension between mortality and celebrity. Photogenic expiration—and thus, irrelevancy—threatens her vernal body. Oscillating between depictions of demure ingenues and seditious “anti-heros” (IRA fighters, Bernardine Dohrn of the Weather Underground), the photographs in Mary’s exhibition are culled from public archives and reprinted on diverse sculptural substrates. However, not all engage as explicitly with time’s deleterious effects on the flesh. Elsewhere, images on sinuous metal sheets and crumpled Mylar repel associations with the body’s vulnerability, instead evoking sheaths that insulate and abstract, complicating the legibility of representation. A roseate print of Lee Miller’s eye, Untitled (Lee Miller’s Eye), 2017, rests in a corner perpendicular to a mirror; the symmetry provided by its reflection completes the absent half of her face. This doubled gaze seems to implicate the (perhaps male) viewer, whose eye might also be caught in the looking glass: Mary’s Medusan gesture invites accountability for our insidious cultural crafting of female subjectivity.